Strong Racial Feeling of Jews. The western extremity of Asia, which seems to have been known to the Jews at a relatively early date; for to this region belong the greater number of the sons of Japhet mentioned in the ethnographic lists in Gen. x. Von Gutschmid believes that there was a dispersion of Jews in Asia Minor in the middle of the fourth century B.C. ; but it is probable that Jewish colonization did not antedate the Seleucids, though Josephus mentions the existence of relations between Jews and the inhabitants of Pergamus, extending back to the time of Abraham. Toward the end of the third century, at the time that Greek communities began to be formed in the villages along the coast, Antiochus the Great (223-187 B.C.) installed in the more thinly populated districts of Phrygia 2,000 Jewish families from Mesopotamia (Josephus, "Ant." xii. 3, § 4). The Jews formed military colonies at these places, the principal of which seem to have been Apamea, Laodicea, and Hierapolis. The name κατοιχία (colony), which Hierapolis retained for four centuries, attests the nature of the settlement. Before the death of Antiochus, Asia Minor passed forever out of the grasp of the Seleucids. Their successors, the Romans, followed the same favorable policy toward the Jews; at first protecting them in the various states in which the country remained divided ("Letter of the Roman Senate to the Kings of Pergamus, Cappadocia," etc., 139-138 B.C. ); and, later, defending them from the ill will of the Hellenic population among whom they lived, when, after the year 133, these states were successively annexed by Rome. The Greek towns regarded with disfavor the settlement among them of this strange element, which, while claiming to participate in communal life, still adhered to its peculiar customs and organization. Hence, there developed a sentiment of hostility which in thesecond half of the first century before the common era provoked at Tralles, Laodicea, Miletus, and Ephesus irritating measures, such as the seizure of moneys collected for the Temple, the prohibition of the exercise of the Jewish religion, and even threats of expulsion. Cæsar and Augustus, however, assured to the Jews the rights of sojourn and of free worship; yet it is improbable that in the Greek towns they possessed the right of citizenship and a corresponding share of public honors. On the other hand, they enjoyed freedom from conscription, the exemption from which was conferred on them by Dolabella, proconsul in Asia (43 B.C.). Roman officials seem to have departed from their benevolent policy in only one instance—when, in 62 B.C., L. Valerius Flaccus confiscated at Laodicea, Apamea, Adramyttium, and Pergamus money intended for Jerusalem. He had to answer for the illegal act before the courts. 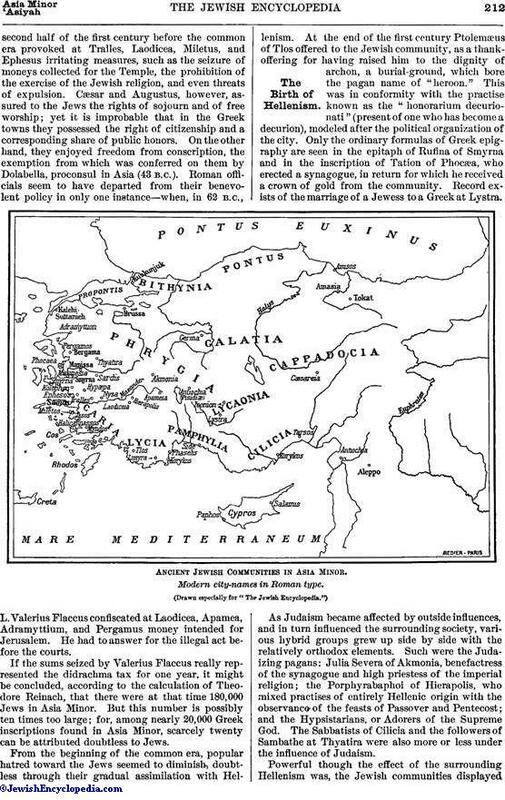 If the sums seized by Valerius Flaccus really represented the didrachma tax for one year, it might be concluded, according to the calculation of Theodore Reinach, that there were at that time 180,000 Jews in Asia Minor. But this number is possibly ten times too large; for, among nearly 20,000 Greek inscriptions found in Asia Minor, scarcely twenty can be attributed doubtless to Jews. From the beginning of the common era, popular hatred toward the Jews seemed to diminish, doubtless through their gradual assimilation with Hellenism. At the end of the first century Ptolemæus of Tlos offered to the Jewish community, as a thankoffering for having raised him to the dignity of archon, a burial-ground, which bore the pagan name of "heroon." This was in conformity with the practise known as the "honorarium decurionati" (present of one who has become a decurion), modeled after the political organization of the city. Only the ordinary formulas of Greek epigraphy are seen in the epitaph of Rufina of Smyrna and in the inscription of Tation of Phocæa, who erected a synagogue, in return for which he received a crown of gold from the community. Record exists of the marriage of a Jewess to a Greek at Lystra. 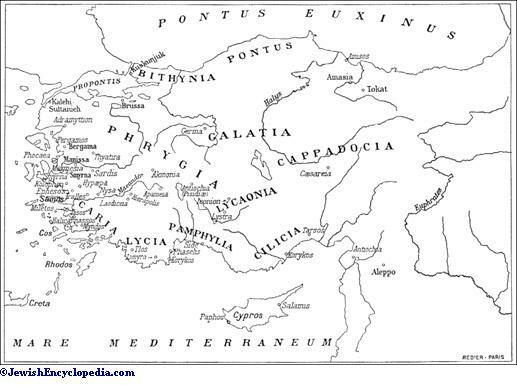 Ancient Jewish Communities in Asia Minor. Modern city-names in Roman type. As Judaism became affected by outside influences, and in turn influenced the surrounding society, various hybrid groups grew up side by side with the relatively orthodox elements. Such were the Judaizing pagans: Julia Severa of Akmonia, benefactress of the synagogue and high priestess of the imperial religion; the Porphyrabaphoi of Hierapolis, who mixed practises of entirely Hellenic origin with the observance of the feasts of Passover and Pentecost; and the Hypsistarians, or Adorers of the Supreme God. The Sabbatists of Cilicia and the followers of Sambathe at Thyatira were also more or less under the influence of Judaism. Powerful though the effect of the surrounding Hellenism was, the Jewish communities displayeda remarkable vitality. Even in the third century, the Jewish colonies of Smyrna and Hierapolis preserved a racial feeling sufficiently strong to cause them to call themselves "laos" or "ethnos" (people) of the Jews. About the same time, the colony of Apamea invoked a particular statute, administered under a law ("nomos"). These groups of Jews, however, seem to have lost all connection with the Jewish centers of Palestine and of Babylonia. The Talmud ignores them completely. According to a doubtful tradition, R. Akiba and R. Meïr went to Mazaca in Cappadocia; and, according to the Pesiḳta, an obscure haggadist, Nahum, preached at Tarsus. M. Jastrow disagrees with Kohut and Neubauer, in identifying the Biblical Ludim with the Lydians. 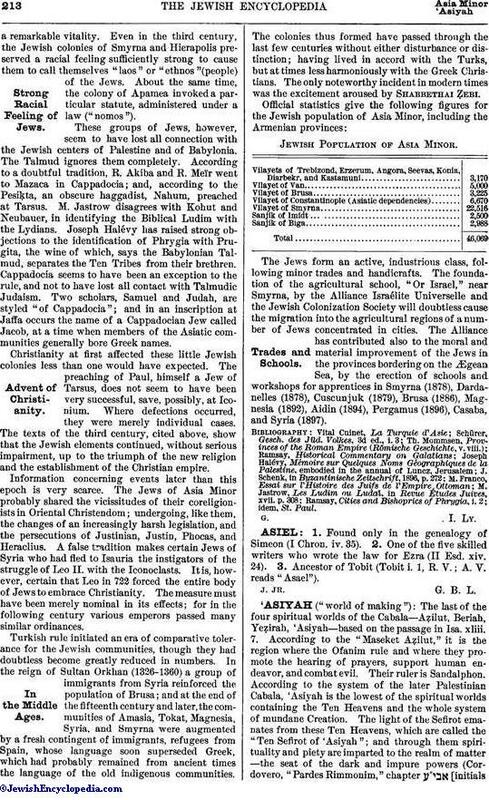 Joseph Halévy has raised strong objections to the identification of Phrygia with Prugita, the wine of which, says the Babylonian Talmud, separates the Ten Tribes from their brethren. Cappadocia seems to have been an exception to the rule, and not to have lost all contact with Talmudic Judaism. Two scholars, Samuel and Judah, are styled "of Cappadocia"; and in an inscription at Jaffa occurs the name of a Cappadocian Jew called Jacob, at a time when members of the Asiatic communities generally bore Greek names. Christianity at first affected these little Jewish colonies less than one would have expected. The preaching of Paul, himself a Jew of Tarsus, does not seem to have been very successful, save, possibly, at Iconium. Where defections occurred, they were merely individual cases. The texts of the third century, cited above, show that the Jewish elements continued, without serious impairment, up to the triumph of the new religion and the establishment of the Christian empire. Information concerning events later than this epoch is very scarce. The Jews of Asia Minor probably shared the vicissitudes of their coreligionists in Oriental Christendom; undergoing, like them, the changes of an increasingly harsh legislation, and the persecutions of Justinian, Justin, Phocas, and Heraclius. A false tradition makes certain Jews of Syria who had fled to Isauria the instigators of the struggle of Leo II. with the Iconoclasts. It is, however, certain that Leo in 722 forced the entire body of Jews to embrace Christianity. The measure must have been merely nominal in its effects; for in the following century various emperors passed many similar ordinances. Turkish rule initiated an era of comparative tolerance for the Jewish communities, though they had doubtless become greatly reduced in numbers. In the reign of Sultan Orkhan (1326-1360) a group of immigrants from Syria reinforced the population of Brusa; and at the end of the fifteenth century and later, the communities of Amasia, Tokat, Magnesia, Syria, and Smyrna were augmented by a fresh contingent of immigrants, refugees from Spain, whose language soon superseded Greek, which had probably remained from ancient times the language of the old indigenous communities. The colonies thus formed have passed through the last few centuries without either disturbance or distinction; having lived in accord with the Turks, but at times less harmoniously with the Greek Christians. The only noteworthy incident in modern times was the excitement aroused by Shabbethai Ẓebi. Jewish Population of Asia Minor. The Jews form an active, industrious class, following minor trades and handicrafts. The foundation of the agricultural school, "Or Israel," near Smyrna, by the Alliance Israélite Universelle and the Jewish Colonization Society will doubtless cause the migration into the agricultural regions of a number of Jews concentrated in cities. 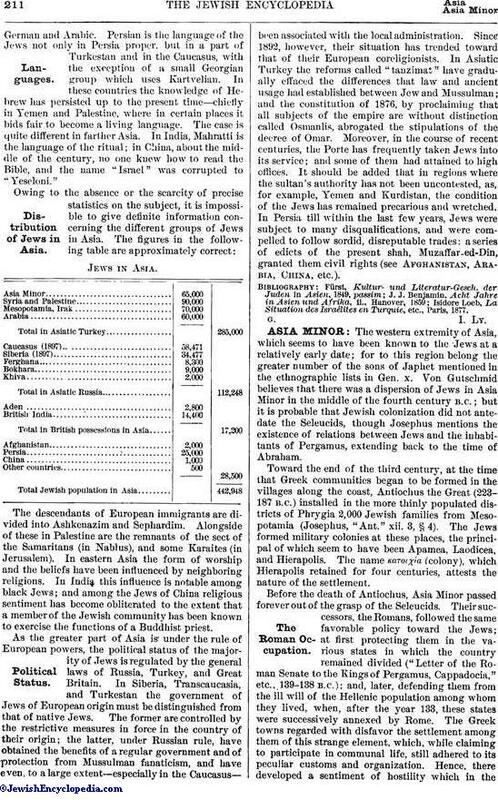 The Alliance has contributed also to the moral and material improvement of the Jews in the provinces bordering on the Ægean Sea, by the erection of schools and workshops for apprentices in Smyrna (1878), Dardanelles (1878), Cuscunjuk (1879), Brusa (1886), Magnesia (1892), Aidin (1894), Pergamus (1896), Casaba, and Syria (1897). Ramsay, Cities and Bishoprics of Phrygia, i. 2; idem, St. Paul.